The Kimmeridgian of the "Champagne Berrichonne"
This formation covers part of the north of the Champagne berrichonne, from Bourges to the little town Sancerre near the Loire valley. 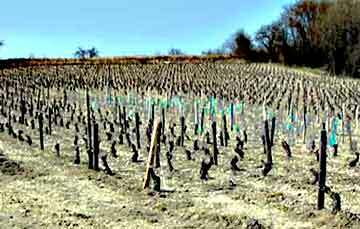 The vineyards of Menetou-Salon and Sancerre, well known for their most characteristic type of vine, the Sauvignon, prefer before all, the marly limestone grounds of the Kimmeridgian stage. At the base of the formation, a level with green lumachellic conglomerate separates the "Marls from St Doulchard" and the "Limestones of Buzançais" ( lower Kimmeridgian, Cymodoce zone p.p.). Than follows an alternation of gray marls, becoming black in the depth, and fine limestone of clear gray to dark gray color, sometimes covered with a beige patina. The marly deposits nevertheless dominate. At the top, the layers of limestones become more significant and are accompanied by many lumachelles of Nanogyra striata (Smith). These deposits are very irregular, often lenticular. Apart from the small oyster Nanogyra that Berrichons formerly called "sheepdewclaw ", the macrofauna is composed in the following way : bivalves - Pholadomia, Trigonia.. brachiopods - Xestosina..., (rares) sea-urchins and ammonites. Nanogyra striata or "sheep dewclaw"
The variations of facies and fauna indicate a succession of two environments. First is agitated and not very deep (presence of pebbles and remains of fossils). The second, calmer and deeper, probably following a new marine invasion, is characterized by the lacking of pebbles and the presence of pelagic organisms, like ammonites. 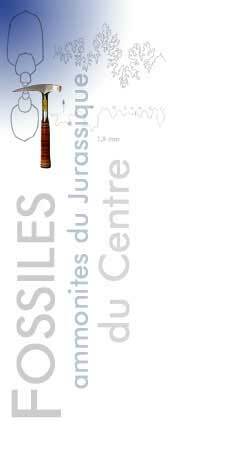 It is also in the "Marls of St Doulchard " where had been discovered the plesiosaure of Berry-Bouy, exhibited in the Natural history museum of Bourges (Cher) France. Foraminifera, mainly of the family of Lituolidae and rare Lenticulina.